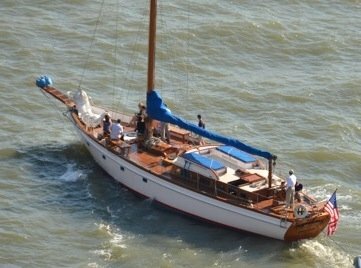 Built in 1921 by Nathanael Herreshoff, America’s greatest yacht designer, Ventura is a Federally-documented National Landmark sailing vessel. A true wooden ship! Ventura is 72 feet long and carries 25 guests. Ideal for client or staff entertaining or a special event. 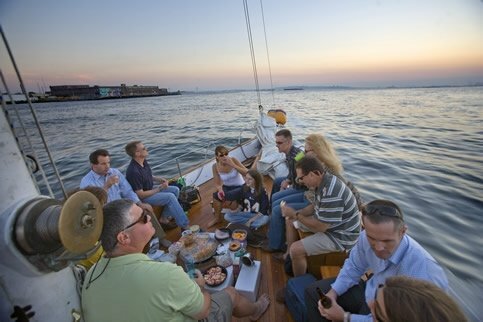 By far our most popular evening sail for entertaining clients! This three hour sail (average price $225 per person all-in) features the exclusive hire of Ventura – your group only aboard – an upscale cocktail party menu and a complimentary selection of imported ales, beers, red and white wines and soft drink bar, for 16 to 20 guests. More than 20 guests? No problem. Add $199 per person, up to 25 guests. Price includes boat, bar, cruise, all marina fees, any/all taxes, etc. No surprise add ons. Average price, grand total, $200 – $250 per person. A top shelf bar of vodka, gin, rum (of course) bourbon, single malt Scotch may be added at a surprisingly low cost. Ask for details. The cocktail party menu with entrees is available for smaller parties as well, with special pricing for groups from two to ten! 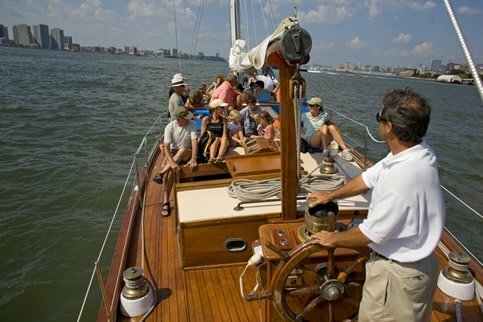 This three hour evening charter is exceptionally popular for client or staff entertaining, special events, and harried planners – you organize the people, we organize the rest! 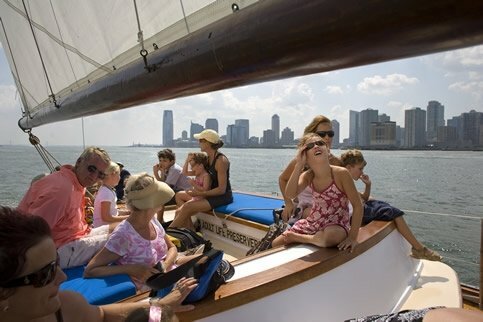 Sailing any Monday through Saturday, this private, two hour cruise features a great harbor tour, sailing to the Statue of Liberty, and a casual “sailin’ sandwiches ‘n salads’ picnic lunch for 12 to 15 guests. More than 15? No problem: add $89 per person. Typically, 20 guests will be aboard, for an all-in (boat, food AND the bar) average price under $129 per person. Great food, great boat, great value! 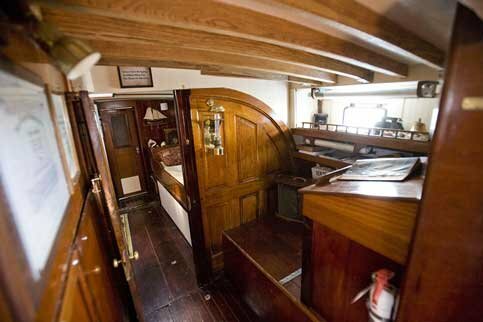 Up to 25 guests may very comfortably enjoy this delightful sail! Price includes complimentary beers, ales, wines, bottle water and soda! A great outing for those casual days at the office. For an extra special day add an extra hour for only $19 per person. A cash gratuity for the deck crew is customary, but optional and may also be added to your credit card if more convenient. All major ccards accepted. 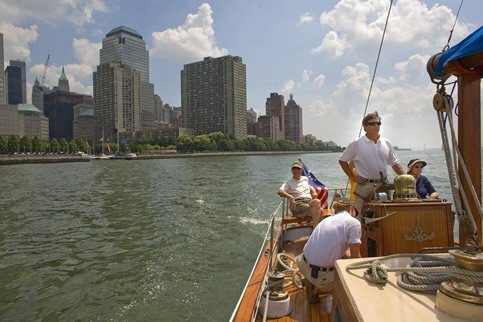 Afternoon cruises must return to the dock by 4:00 Monday-Thursday, 4:30 on Fridays.